My First Game – What's in a Game? You own an animal shelter in your pocket! 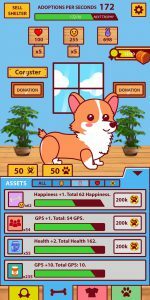 Rescue, adopt, and play with cats and dogs in an exciting mobile incremental game. How many adoptions can your shelter provide? What’s the best part? Profits go to REAL-LIFE animal shelters! How many real animals will your playing affect? While you wait, you can check out my posts to learn about game design and development of some of my favorite games. Learn more about me. Follow my posts here. Also, very special thanks to JDoArts for his artwork on my game. Check out his other stuff here.